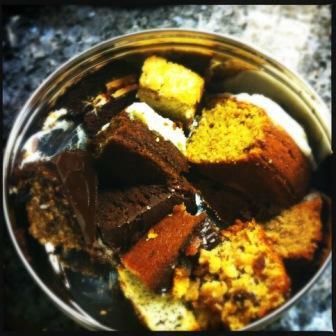 Today was the inaugural meeting of the Bolton Clandestine Cake Club, and I was lucky enough to bag a place. The aim of Clandestine Cake Club– now a national phenomenon- is to bring bakers (and their non-baking, but cake loving friends) together to eat cake, make friends and have a natter. It is non-competitive meeting so there are no winners and losers- just lots of happy eaters. 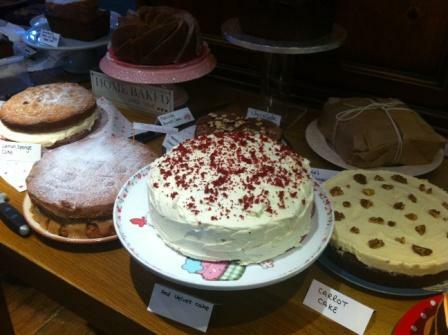 Organised by Rachel McGrath (aka DollyBakes on Twitter), the first Bolton meeting took place at Thyme Deli in Horwich. By the time I arrived in the dining room at the back of the deli, the tables were already groaning with cake, and I had to squeeze my creation in on the end! 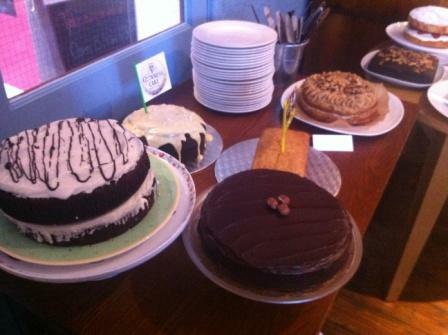 I think there were nearly thirty cakes- that is a lot of cake to try…but I like a challenge! Ok, so I didn’t try them all but I had a really good go. Highlights included the lemon curd which came with a ginger sponge, the chocolate orange cake (beautiful and tasty), chocolate Guinness cake (there were two but I only tried one) , a giant chocolate fudge and the crazy carrot cake. In fact, who am I kidding? Every cake was a highlight! My own creation was a chocolate hazelnut cake from a Nigel Slater recipe. You can find the recipe online here. more cake…that’s mine at the front! The best bit of there being so many cakes is that you get to take a load home – so I have enough teeny taster slices to last for a few days! Rachel did a brilliant job organising it (and encouraging me to dust off my rollerblades, but that’s another story) and Amanda and the team at Thyme were so friendly. I think Rachel said she’ll try and do them every six weeks, so if you are in the vicinity of Bolton and love cake, sign up and have some clandestine fun!